As use of lasers, photo-detectors, and PC's has spread, they have been used more and more in concert with optical microscopes, especially inverted microscopes. The Nikon Inverted Microscope TE2000 responds to this market demand by utilizing a special "stratum structure"to allow the use of multiple modules simultaneously without altering its configuration. Here we will introduce examples of such upgraded systems with the Inverted Microscope TE2000. This example shows how a single laser may be shared through an optical fiber to enable simultaneous TIRF and confocal imaging (Figure 1). Various imaging techniques may be used to observe different parts of a cell utilizing the characteristics of each. For example, TIRF imaging can be used to observe the portion of cells in contact with the coverglass, while confocal imaging may be used to observe the area near the basal surface. Further, Surface Reflection Interference Contrast (SRIC) microscopy may be used to check which part of the cell is in contact with the coverglass without fluorescence prior to TIRF in order to reduce cell damage. Thus, researchers can leverage TE2000�s stratum structure and expandability to view different sections of a single cell according to parameters they set. After fixing in 4% formaldehyde, cells were treated with 0.25% Triton X-100 before double staining with paxillin antibodies and TRITC-phalloidin. This cell is moving toward the right, and a part of the right side of the cell is shown. The basal portion of the cell. 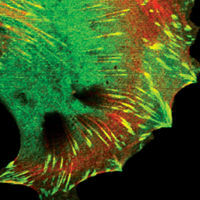 A clear band of substantial F-actin (red) is shown at the leading edge of the cell, which is migrating toward the right side. Paxillin molecules are green. Stress fibers are facing the rear of the cell. Strong and clear fluorescence derived from paxillin is observed in the evanescent field. The focal adhesions existing at the portion of cells in contact with the coverglass were clearly confirmed. 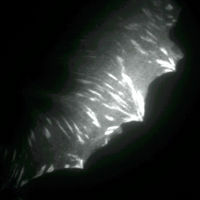 This SRIC image was observed using a conventional epi-fluorescence microscope with a simple modification. The black area is closest to the coverglass, and indicates presence of paxillin molecules (focal adhesion). This method is available for identifying the portion of a cell in contact with the coverglass prior to TIRF imaging. This example shows how the TE2000 may be used in combination with Nikon C1 confocal microscope. When Nerve Growth Factor (NGF, 100 ng/mL) is applied on PC12 cells (rat adrenal pheochromocytoma cell line), active neurite with growth cones extends from the cell body. These growth cones contain vesicles that are endowed with vacuolartype- ATPase (V-ATPase) proton pumps to maintain an internal pH of 5-6. Intravesiclar pH is neutralized when the vesicle fuses with extracellular fluid during exocytosis. Ratiometric- pHluorin is a pH sensitive GFP. pH inside a vesicle, and it is estimated by measuring the ratio of fluorescence intensity by dual wavelength (410nm and 488nm) excitation. The fusion protein VAMP- pHluorin was made by combining pH sensitive GFP and vesicle protein VAMP, and it is used to estimate the pH inside a vesicle. In figure A Neutral pH vesicles (indicated by yellow to red color) in the vicinity of the cell bottom of the growth cones were imaged. Figure B is a histogram of ratios of fluorescence image of growth cone. There are many pixels in the neutral pH (indicated by the arrow), suggesting many vesicles are undergoing exocytosis at the cell bottom. 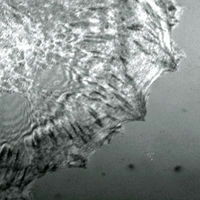 Image courtesy of Oshio, Tsuchiya, Tatsumi, Kataoka*, Sogabe, Nagoya University School of Medicine. *Shinshu University.